Brenda will be showing a wide range of her works produced over 45 years, along with new unique abstract collages and mixed-media paintings. These include her embossed watercolours, encaustic wax and acrylic paintings. 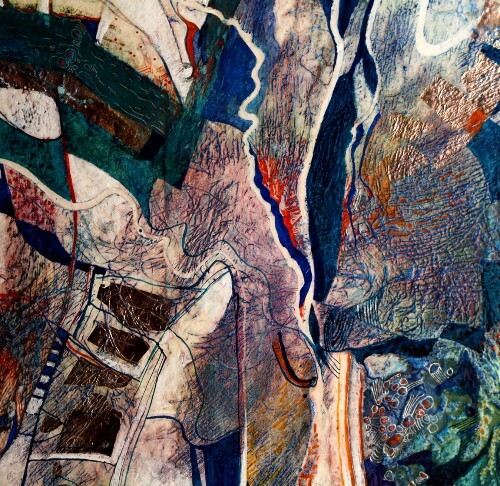 She is best known for her heavily embossed limited edition etchings and collagraphs, based on landscape forms. See a good selection of her early, rare, finely detailed figurative etchings and many Artist Proofs at half price. Brenda is a member of the Royal Society of Painter Printmakers(RE), Rye Society of Artists, and Pure Arts Group and has shown in galleries worldwide, including Bankside Gallery London, New Academy Gallery London, Cambridge Contemporary Art and Attic Gallery Swansea. Her influential book “Collagraphs and Mixed-media Printmaking” and her DVD about her work and methods, “Collagraph, a sculptural approach to printmaking” will be available, to view and purchase.